If you get up early today and can get going right away, there’s a Swiss treat that starts at 7am but goes on to about 10:30am. 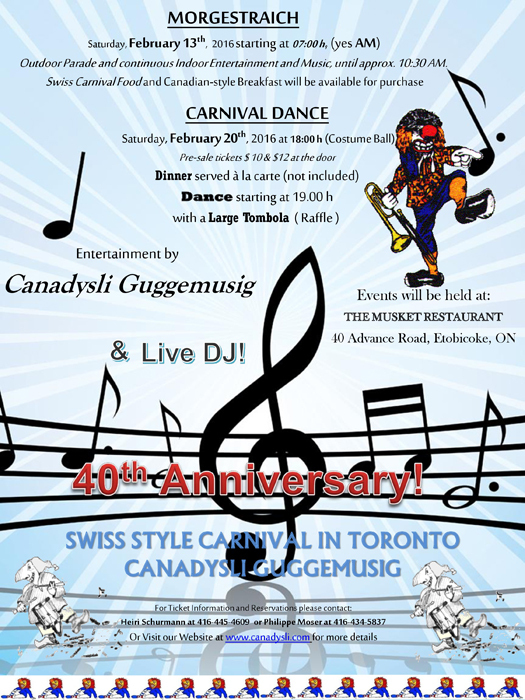 An outdoor parade inspired by a Swiss carnival marches around a block in Etobicoke. The band also plays indoors. It’s a free concert but you do have to pay for food, some of it genuinely Swiss. Head for the Musket Restaurant at 40 Advance Road. See our Blog about this lively event: http://bit.ly/1LmtNID. If you miss it, there’s the Carnival Dance on February 20 at the same place but it costs $10-$12 plus food. And you don’t have to be Swiss to enjoy it.